I’m teaching this upcoming year in LifeBook, which has a long and stellar list of teachers offering all their varying and creative lessons! My class is entitled Joy of Intention: Create a life-affirming mixed media art piece based on manifesting principles and conscious language practices. Learn to paint with a variety of materials, including: ink, paper, and more to make one sparkly-gorgeous work of art. I can’t wait to share it with you, along with many other delicious goodies in my Year of Painting class. But wait–there’s more! You can win a spot in this course by simply leaving a comment below. Simply share why being creative is good for you or why you enjoy it! *UPDATE: Your answers are so exquisitely gorgeous and are touching my soul deeply! I realize that since creativity has been my way of life and source of income for many years now, I should probably share just what it means to me. For me, creativity is about turning and tuning in to a meditative state where I feel simply content. From this place my mind gets to take a rest and my intuitive and child-like playful spirit takes over. Colors, textures, lines, and subject matter become alive and reveal to me deeper languages that sometimes I do not have words for. It is healing and fulfilling. I have seen time and time again how art can save and transform a life, through its intention and the sheer joy of creating. The Universe responds to what you put out, it becomes a personal reflection of your mysterious soul, a way to awaken and bring people, experiences, and abundance (true abundance) into your life. Here is the list of other teachers in our big Blog-Hoppin’ party! Creative community just rocks. I would love to be able to participate in Lifebook 2014. Thank you for this opportunity. I am very excited about LifeBook. It is wonderful to get to know so many talented and generous artists. I love to paint because it is a meditative experience for me where time stops and I can just be with myself. I would love to be a part of this class – and you class too!!! Looks amazing! I love Life Book! I am taking it right now & I have to say being creative is like breathing to me, something that I can’t live without! I notice that I get grumpy when I’m not being creative…so that’s when I pull out the paints and do a Life Book lesson. Looking forward to doing your lesson in LB 14! Being creative is an important outlet in my life. There has always been a part of me that needs and craves it in order to feel whole. It’s like there is this creativity bursting to come out and be expressed. When I am being creative I feel like I am in another place and it’s almost meditative when I produce my art. It feels good to be in that place and then to share afterwards what has come of it. It’s vital to people like me to have a venue for creativity. I am always looking for new ways to express my creativity as well, and I feel that these teachers would introduce new ways to do that. I have always loved your art and would love to see what these teachers have to offer as well. Thanks for the opportunity! Being creative is good for me because it allows a light to shine. I’m happiest when creating and connecting with my Creator. Being creative is good for me. It distracts me from worries and is also a good challenge. My skills are improving year on year. I love the variety of life book. As a mom creativity helps me bond with my children, but it also allows me to come back to myself. When I’m creating anything, a new hat, painting a portrait, or writing a story, I remember who I am, and get to be just me for a bit. Not mommy, wife, sister, lover, just me. And for that, I believe creativity, and the ability to express myself-has saved me. I would love a spot in Lifebook 2014! For me being able to be creative lets me get my thoughts and emotions out on a different level, it allows me to express myself in ways I other wise couldn’t. Creating gives me a chance to take time for myself and make something tangible out of the chaos in my head! I love the process of taking inspiration and imagination and playing with paints, paper, inks, textiles and found objects to make a vision into a reality. Being Creative for me is the very essence of life. I spent most of my life in performing arts. I sang, played guitar and told stories. At the turn of the century i had a health challenge that proved to be a game changer. Well, if one is no longer able to express themselves in one way – what happens is – creativity bubbles out in other forms. 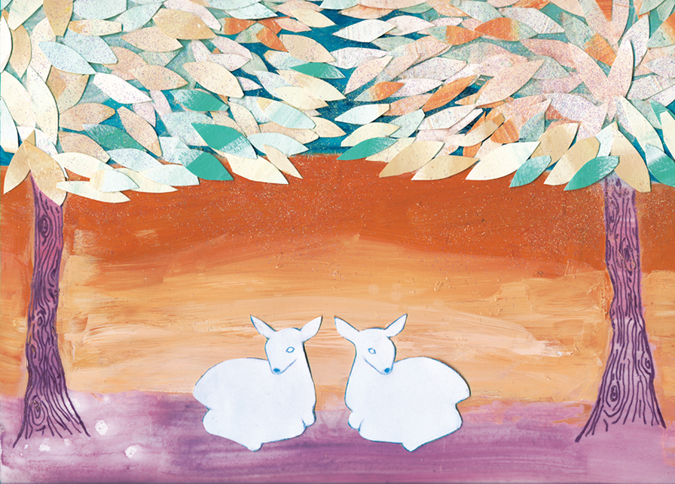 I have recently discovered mixed media – my beginning steps look childlike – my heart is happy – what more could i ask, hm? I would like to be included in Life Book 2014 – the Truth is – just visiting these beautiful blogs makes me feel wealthy with possibilities. Thank you for sharing your talents with so many. I love the flow of creativity– setting an intention, or picking up a brush and then giving yourself to something bigger. It feels so natural and powerful to create. I think we’re all deeply creative and that when we start trust our own creativity, we move into much closer alignment with our own soul. It’s a beautiful, fulfilling, wild wild ride. Being creative connects me with my soul. Art has learned me to listen to my inner voice and sing the songs my heart wants to. Through art I learned to be brave and express myself. Being creative made me blossom in ways I could have never imagined. After two decades of living an unfulfilling life I’ve set out on my own quest to live a happy and fulfilling life. Being creative is my guiding light and beacon of joy on this winding adventurous journey. Creativity is at the core of how I believe that I have been fashioned. We all exhibit creativity in so many different areas of our lives (though some of us are unaware), and I think exercising our creativity makes us more fully human. I personally love to create with my hands (with paint & paper, fabric & thread, clay & wheel, etc. ), and fashioning something new out of something old is especially satisfying. I find that I am a better mom, better wife, & better friend when I make time to create. Because when I have had a chance to express myself, I am then better able to be present to the other person – to really listen and to love. Oohhh…… I would love to win a spot in the life book class! It sounds very inspiring and makes me curious. I want to find out more! I enjoy being creative because it makes me whole. When I’m in the creative flow I forget about everything around me and time seems to stand still and fly by at the same time. I love that feeling of being totally in the moment. I think my head would explode if I was not able to express myself creatively! It gets me out of me head and into my soul. I’m excited to participate in Life Book next year. I just couldn’t fit it in this year but feel like I missed out. That’s not going to happen again. Do I see trees in your artwork? Trees have always been a thing for me. They represent growth and change among so many others things. I’d love to take part in your classes and all the amazing artists this next year. It will be my first Life book and like great trees, I will only grow and change along the way. Yes Gayle, I have tons of trees in my art! One of my favorite things to paint for the same reasons you mention. Hi Alena, I would love to win a place in this years Life Book course. Thank you so much for offering this opportunity. Being creative for me is like breathing…I know when I’ve been holding my breath either through fear or doubt or just forgetting how much I love expressing myself through art or words…in those moments when I create and breathe with all of me I know who I am again. Many blessings. I would love the opportunity to win a spot!!!! I write for a living, so for me, creativity is my life. Art gives me the opportunity to explore creativity in a way that isn’t about how much money I’m making or how many words I can produce. It’s a chance to be creative just for me, and I would love to learn new ways to explore this part of myself! Lately I feel an intense need to create, it is nourishment. Hi Alena! Being creative is literally good for me. Since I began a practice of doing some artwork every day, my high blood pressure has gone down. In addition, I truly feel a lightness in my soul!!! Thanks for this chance to win!!! I enjoyed LifeBook 2012, even though I only managed to take half the course…i couldn’t afford last year but I really hope to find a way to take 2014! The course helped me to face myself and my difficulties and gave me a reason to dust off my art supplies! Your work looks so joyous and fun, you will make a wonderful guest teacher! I hope to be able to take your lesson along with the others! I enjoy being creative because it allows me to drift into another state of mind. A place where I can listen to my heart, travel to an ethereal place and bring magic to light. Thank you for this opportunity and blessings to whom ever wins. I would love to take one of your classes, I love what you do. 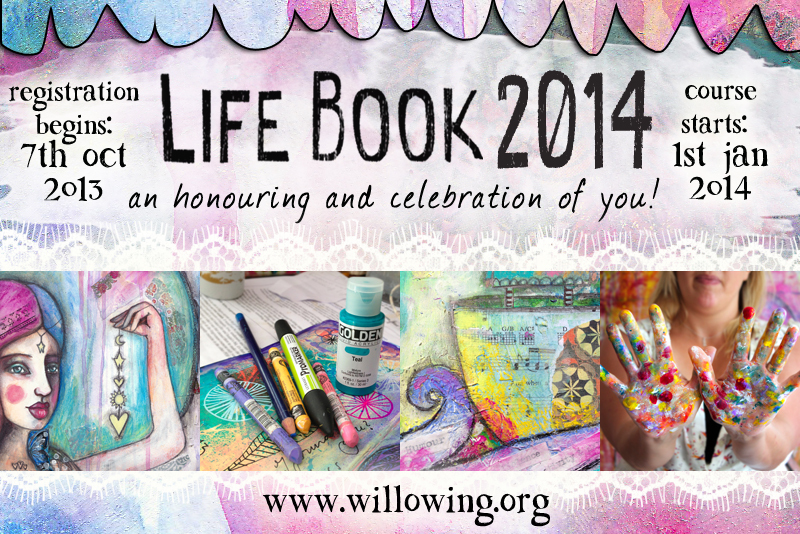 There are so many other wonderful artists in the Life Book line up for 2014 too. I would be thrilled to be the lucky winner. I’ve really enjoyed visiting and seeing your beautiful art. Not being creative you miss the soul of life. I am so thankful for finding such wonderful creative people who share what they do. Creating on any level is akin to meditating, it touch’s one’s soul deeply. Thanks for the chance to win a spot; art is good for me because it is my stress relief!!! thank you so much for the opportunity. being creative feeds my soul and makes me feel like I can breathe again. Thank you so much for this opportunity. I am looking forward to learning more about you and your work, since this is the first time I have stumbled across you! Being creative for me is also a meditation of a sort. Amidst all the chaos in my life, when I create I lose myself and forget all my worries for hours. I cant wait to learn from so many talented artists! Thank you so much for a chance to win a spot in this fantastic art class with so many great designers ! Art journaling is such a great outlet for my inner feelings and I would love to get more inspiration and learn new things !! I am so excited you are one of the teachers, Alena ! Creativity os good for me because it is one of my tools to channel the Source. To soothe my Heart. To put salve on my wounds. To imagine my future. Creativity is part of me now. I’ve always had to have a creative outlet. In nursing school I took a pottery class and sang in the choir, much to the dismay of my nursing instructors. Now, as an ER nurse for 25 years, I need that outlet even more. Life Book has been the perfect stress-reducing artistic outlet for me. I’m so looking forward to Life Book 2014! Being creative makes me feel fully alive and present in the moment. For this, I am so grateful! I would really enjoy learning from all of the artists. Being creative keeps me grounded. When I am creating I feel like my true self. I may at times get caught up in the daily race. When I connect with my creativity I am at peace. Because being so far away in Chile, my Creativity ignites just being inspired by all the strong ladies behind Life Book as a reality that allows sharing, nourishing and growing as artists. Love the fact that we are now in a world literally with no boundaries for allowing our deepest thoughts to become one vibrant stream of creativity ……that is why I enjoy it. Life Book 2014 is for me!! Here I come!! Art touches a place in my soul that words cannot. Thank you for the beautiful offering. Being creative is good for me. It is an outlet in my life. I relax and enjoy when I create mixed-media projects or paint. Being creative is good for my soul…And I enjoy art and creativity because I love the things that people make and am often inspired by them or even just by the intensity of a color. Creativity. It makes me feel timeless. It pulls me in. It opens me up… my mind and my heart. It makes me happy. Creating makes me happy and gives me a good feeling about myself. Love the feeling of paint on my hands…the insecurity when I start something and don’t know where it will end and the satisfaction with where the painting will lead me!!! Creativity for me is like being in the eye of the storm – while everything else surrounding me seems tumultuous, if I am creating, I remain still, centered & joyful to the very core of my being. Thank you for this opportunity Alena! I could try to come up with a poetic or profound reason that creativity is good for you, but in all honesty it just keeps me sane… and it probably keeps my friends and family safe from me! Being creative makes me feel alive. Hope it’s not to late to leave a comment. Being creative is good for me because I get to do something that does not require a set of rules or standards. I get to express good or bad and I need that kind of space. I can enjoy that no pressure kind of space, because my life is filled with so much of the pressure. I enjoy being creative because it is the food of my soul. It is when time stops and I’m truly myself. It makes me joyful and grateful! it’s something to look forward to after a long day at the ‘jobl , it’s my stress relief…. thanks for a chance to win! looking forward to your lesson. Being creative releases feelings and thoughts from deep inside me that I can’t express any other way. It gives me a place all of my own where I can do or be anything. Creating is good for me since it lets me relax,forget the pressures of life and if I make something for another person it lets them feel special in some way too. I think being creative adds joy to the earth and brings all kinds of people closer. What a wonderful opportunity to be able to create from a place of joyful sharing. Creativity feeds the soul. It allows you to be the real you. Painting is my outlet to be one with myself and all things. It’s a place of truth and honesty, of heart filled joy and love, of living in the present moment. It is what is truly “real” in this world. Thank you, Alena, for allowing me to remember and honor what is my true joy. What a beautiful way to live. all the instructors are spectacular. and makes me a more thoughtful and observant person. I love to be creative, because this is my world. Creating makes me Happy. That Simple. Without my art, I would be lost plus I have the privilege of teaching my granddaughters. It is so enriching seeing the creation of art through their eyes as well. Being creative disconnects my brain and engages my soul. It lets time stop. It lets me channel my joy, pain, happiness, anger and sadness. I can process thoughts and feelings that my logical brain just can’t understand. I could never understand the idea of meditating in the traditional sense… sitting quietly and breathing… but art is my meditation. My bliss. Being creative is good for me as it feels so necessary, that feeling when you are in the moment just feeling your way, it’s refreshing, invigorating and once you feel that way about your creativity you can incorporate it into all of your life! I enjoy being creative because it brings me into the center of me. When I create I am being who I truly am at my core. When I create I get in touch with me at my very best. Being creative slows the chatter in my mind, helps me to escape from the day to day difficulty of life. It is my breath, my heart, and my hope. I love being creative because it makes me forget everything else! I have a family and a busy job and with all the things on my to-do list I find it hard to stop thinking and just be. Art – in particular mixed media – is a great way to do that! It helps me take much-needed breaks, to feel, to meditate, and to just play! I love being creative. I get to play and have fun, and try new things and technique. I enjoy being creative and sharing my creativity. I am working now to set up more art workshops to help people increase their self-esteem. It has been so rewarding! Going through this workshop would teach more so much more and expand my creativity. I really would love to join Lifebook. I’m an elementary art teacher so creativity is part of my every day life. I’d love to learn more from these talented artists. seriously….it allows me to be free to be me.. when I’m crafting/creating it’s just me, myself and I time. Being creative makes my soul happy–it allows me a chance to play, to grow, to experiment, to make something pretty and fun that hopefully I can share and make someone else happy as well! I do not have any arty plans for 2014 yet, please choose me to win the life book place, Ive been watching a friends art improve this year with her doing it. I would love to be able to have something that is all mine alone. Being creative allows me to be free. It allows me to dig deep inside to be honest and truthful with myself. I art to heal my broken self. Creating is that process that helps me deal with life and my feelings. I am most happy when I am creating! I was once told that I wasn’t the creative type. Let me tell you, I have proven them wrong. I would love a spot in Life Book. Creating art has always been and will always be an important part of my life. It makes my mind free of stress and helps me deal with everyday challenge. As a mom of four, creating art is also often the only time in a day I have for me. Being creative makes me feel alive. It helps me express myself and my feelings. It takes me away from the everyday to a sacred place. Art saves me. I am an introvert of sorts with a very stressful job in the legal field and seeing the less than desirable sorts all the time can really bring you down and bring your view of the world down or just watching the news can do the same thing, but art brings me to a place of comfort and peace. Without art I would be lost. Also I have met so many kind, generous and thoughtful people in my art groups. Be creative is the best way, to me, to be myself, in spite of everything! My intention is to be part of Lifebook 2014 in order to continue my creative journey. I have always been an artist, I was born an artist, yet, In my earlier days chose a professional path for what I thought was security, benefits, etc. I realize my only path is to lead an artful life and I would love to continue that journey with Dearest Tam and the awesome teachers on Lifebook 2014. I would love to part of this fantastic group of artists, to learn all I can and take time for me to reflect on things that happen in our life. in a nutshell, this is why i create and why the canvas chose me…ENJOY! suppressing objective patterns of negativity. emanating into magic and beauty. I’m Valeria from Italy. Thanks for the opportunitY! When i’m painting or creating I feel finally free. It’s the only thing completly mine, It ‘s my world, my air, my life!!! Begin creative allows my emotions to come through and I guess release as well. I just can’t help it if I am feeling a little down its good to sit and let it out on the page – even if the painting/sketch is sad. You can also be expressive with colours. Being creative is also about sharing and giving. I just love to create and give my paintings as gifts – I love the joy and surprise on peoples faces. Being creative is being me…. how lovely to have a chance to win a place in this course and to get to study with you. art has become an essential part of my life. It soothes and inspires me. I also find it to be meditative as well as exciting. Exciting because i never know how a piece will turn out or who will show up in it. Being creative is good for everyone. We all create every day in various ways. Creating (whatever it is) allows something to enter the world that wasn’t there before. I especially love creating art, because it allows more joy to enter the world. I trained professionally as a ballet dancer many years ago and whenever I danced I was also to express in movement and gesture what I could not say in words. I work now as an Intuitive Counsellor and Consultant and Creative Self-Expression forms a huge part of the work that I do with others to support them in remembering who they are… Intuition, Creativity and Healing each support and inform each other, Creativity, like being Intuitive, for me is like breathing… it’s who I am, it’s the work that I do, it’s what will heal each of us, and the world. Being creative for me is about balance. I am full time working mother of 2 so having something that is just for me is important. It also needs to fit in with that busy life. I work on a computer all day with figures and deadlines so being able to produce something pretty or thought provoking or just something that I like it look at is just good for my being. I look forward to getting my creative time and gives me a spark of excitement to each day. If I am not creating it, I am always thinking about the creative process and it does make you look at the beauty in the world which you figure out how to capture in your own creative way. I just turned 40 and have just learnt to draw faces…wow it’s so damn exciting!!!!! Would love to take a magical journey into so many artful minds. Making art makes me lose track of time. Making art makes me feel whole. Making art heals my heart, lifts my soul and makes me smile. Creativity puts me in touch with spirit; something magical. It helps me bring my dreams to life! Thank you for this opportunity! Art has recently become a huge part of my life. It lifts my spirit and i just feel so great when i get to play with paint and colors. I’m not sure how i could live without it before. Being creative through art makes me feel something that doesn’t come naturally, proud. I am rarely proud of anything I do, never really feel adequate. But my art is different, when I create art I feel so proud of what translates onto the paper or canvas – even more so when others ask me to create for them or for their loved ones based on what they have seen. Thanks Alena for the chance to win a seat! The only way for to solve problems is through creativity, quieting down the noise and letting the sub-conscious come forth through painting or bookbinding or whatever the art of the moment is. I have a very logical and high-speed brain and I need to tune into the void or I can’t shut it off. The void is creation. I have taken the previous two years of LB and would love to be able to continue all that I have learned and experienced so far. LB gives me the continuous inspiration I need to enjoy the rewards creating art brings to my life. Creativity is a way to express oneself in a personal way. It may have meaning for us but mean something different for viewers/listeners/readers etc. Each of us experiences creativity in a different way from the engineer who may express it through designing bridges and roads, or circuits, to the artist who expresses things visually to the composer who expresses things aurally. Hi Alena, I really want to take the life book class. Since your first name is so great I bought your book. I would also like to take a class of yours. My name is Alena and great minds think alike. Hi Alena, congrats on lifebook 2014, I love meeting the artists each year. I see the words, “art heals” alot and i totally get that, with a sick child i needed an outlet, something quiet to do while tending to her needs, I had never been artistic before, but while going through youtube I found art journaling and it has brought me peace and an outlet during a hard time in my life. Being creative is essential for me….. I have mobility issues and creativity is what keeps me sane! We are all creative – it’s part of our DNA. We all express ourselves in some creative way – cooking, decorating, our attire, visual arts. It is important to honor our creativity. Taking a year-long course like this offers the opportunity to learn from a number of talented artists and be in community with others who are on the creative expression journey. Being creative is important to my general well being. With a day job that involves a lot of analytical work, staring at a computer screen in my little plain box, I would go crazy! But through various artistic outlets, I can re-connect with the work done by my own hands, the textures of something other than computer keys, and the colors beyond institutional white. I love creativity. I’ve never really thought about why, and yet, it’s pretty much all I do. I paint, I knit, I draw, I write. I can’t stop myself from creating. When I knit the reason I love creativity is most obvious to me, because on one side of the knitting is this random string. Nothing but a string. But on the other side of the needle is something. Something real. Something that wasn’t there before. Something I brought into being. Creativity feeds my soul because it allows my soul to bring something new into the world. What could be more wonderful than that? Thanks so much for this chance! Creativity is crucial for me because it is one of the few things in my life that is just for me and has nothing to do with caring for others. It is my time of rejuvenation and healing. I love creating because it is who I am. I started creating when I was a child, my mom was always helping me find things to make. As I grew older I became less confident about my abilities. Within the past 3 years or so I have found that art is like breathing to me. It is a necessity! Whether I am doing art with children or making art for family and friends or even selling my art, I just need to make art. I would love to one day have the courage to make videos and teach as some of you are doing. That is a goal. One day it will happen! I just heard about this on line class and I’m so excited to be involved. Thanks for the opportunity to win a spot. Creating art is an important to me as breathing! We discover ourselves through our art. I would love to win a spot, thanks! For me, artistic creativity is a way to escape the rigid parameters of my daily “life” (i.e. my job as a software engineer) – I feel free and unbounded when I’m creating, whether it’s an art journal entry or cards for a charity. Thank you for the chance at Lifebook – it all looks so wonderful! Being creative helps me be ME. That’s it. It is enjoyed by others but its for me and my perspective to be unleashed. I have just started using art as therapy this year. After a number of major health issues I am finding art to be such a source of joy that is extending to every other part of my life too. My 2 gorgeous kids and wonderful husband are delighted with the effect that producing and learning about art is having on us all. I would just love to be included in LifeBook 2014 to be part of the wonderful artist community to share, learn and encourage. Why do I enjoy being creative? That’s a good question that I’m not sure I can answer. I know that I enjoy it. I know that I love it! But I honestly don’t know that I could tell you why I like being creative anymore than I could tell you why I’m tall. It’s just part of who I am, part of my DNA. perhaps that is an answer in and of its self. I enjoy being creative because it is authentic for me. Being creative eases the anxiety I’ve had for many years. It is so calming to get lost in what I’m creating. It’s really opened up a whole new world for me. may lead me in the future and how much a part of my future it may be. I love art because it opens my subconscious, and that’s my favorite place to be. I would love to experience Lifebook 2014! Getting immersed in art or crafts is one of the ways i get creative. It really helps me take a step back from the rigors of everyday routine and challenges especially work and commuting. I relax, find myself and my happy place. Being creative just puts an energy into my life that balances the things I must do whether I want to or not and the things that feed my soul that sometimes get pushed aside for lack of time. Disciplined time to nurture that energy always brings good results. But in a busy, demanding life, it is often hard to sustain. It is not enough to say, Someday I will have more time to devote to my passions. The time is now, I want to be free to be Me! thank you for this opportunity! I am learning to make creativity a part of each day. After retiring a few years ago, I finally have the time to explore what I love – turns out it is painting! Being creative allows me to express what I feel and think and experience and desire and feel passionate about and excited about and to inspire people in a visual means especially when I can’t always find the words to say any of that otherwise. It’s amazing that we have the ability to put something into the world, rather than just take from it. What a fantastic opportunity. I am in awe of all the talent that Tam has gathered for LifeBook 2014 and would love to be a part of it. I have always looked for ways to express my creativity; there’s a power in making that invigorates me. The structure of the LifeBook classes appeals to me because I get overwhelmed by all the ideas and possibilities every time I sit down to my table. Too often I walk away in frustration after fumbling with my supplies because I can’t narrow my focus. To me being creative is just not an option. It is mandatory. Without being creative I would just not be me anymore (and yes, I have tried that). Being creative makes me feel better, more calm, grounds me, makes me happy. Being creative is so much to me. I am rather new to mixed media – but have tried many other techniques and things so far. (I sell handmade buttons as well.) When doing mixed media I love how things come together. How the layers create a new look. How I can use all these things I love – paint, ink, papers, …. I would so love to learn more about it. for me, I have always told myself “you can’t make art. You don’t have any talent” When I discovered art journaling I was finally able to let myself try, which is huge for a perfectionist like me. I would love to win a spot in the lifebook to really challenge myself to not only create, but to create consistantly. I’m so excited! 2014 will be the year I buckle down and art journal consistently! What an opportunity to experience creativity and inspiration with this line up of teachers. I have all these wonderful supplies and sit at my art table wondering what to do. I’m looking to this venue in hopes of experiencing freedom to create with abandon. I’m also excited to be able to share with my 2 granddaughters who are 8 and 14. They love to create art with Grandma. Thanks for the opportunity. I had never taken art during my school years as I felt I couldn’t draw or paint. My sister had a great sense of colour which validated my sense of ‘un art ability’. In my 50’s I started taking scrappin workshops and in one of them we did a she art style canvas…omg! I couldn’t believe I had painted a canvas!!! Needless to say I was inspired to learn more. I began taking online courses. I still find colours challenging so am always keen to learn more about colour theory and about other artist’s creative process. Love finding my own style too. To have an opportunity to join the wonderful teachers and artists in LB2014 would be a dream. Hi, Alena! I love to be creative. When I am creating, all the chatter and noise in my head … that nasty tape player of all the should-dos and have-tos … all of that goes away and I simply am. I am in the moment. I am in the zone. And it is so freeing! Thank you so much for sharing your creativity and for the opportunity to win a spot in Life Book 2014! It would be awesome! namaste. creativity is food for one’s soul. it’s the reason I feel alive..
Creativity has become more and more important in the past few years. Now that I have retired I can actually devote more time to creating and learning new skills. This class would be a godsend. Being creative is what saves us 🙂 It is reaching to that inner self and let is speak so that we are amazed again and again. It creates such a happy state of mind. Although you don’t know me I hope we have the chance to become friends. I have seen your work and it is outstanding! If I could have the opportunity to win a years worth of classes from talented people such as yourself and the rest of your new team, I think I would have died and gone to Heaven. When I am in my room creating I feel the Spirit like I have never felt it before. It is hard every day to be creative when you don’t have formal training in any art form. I just love color. I try, but don’t have the confidence to share everything I make. If chosen for the immeasurable gift I would hope that the confidence I am now lacking can come to me to be shared with others. I am retired and living very frugally. I am not stingy when it comes to my time, but fortune has not come my way, yet. Art, no matter what style you choose is a gift from God to be shared. I hope to do just that if I am chosen by you to expand myself, loosen up and pray for the guidance to my hands to learn to be a better artist and to make you proud that you chose me. Creativity = peace for me. When I am working in my studio I am totally at peace! That’s when I (we) make that beautiful “shift” to inspiration, creativity and love. Creative time means everything else falls away and I can be free to be who I want to be, free to express myself any way I choose. Thank you for an opportunity to have a place in your class. Would love the opportunity to participate. As a small business I create and teach art/craft classes for others several times a week. It would be a welcome change to be the student, create and learn from others. I spent years caring for my mother-in-law who had alzheimers. After she passed, my hubby & I felt washed out. Finally this year I started painting (thanks to Willowing). It has brought me back to living my life. Literally. But now I don’t want to give up my creative efforts, but would adore the chance to learn with so many great teachers. I would like to take that back to my job and make my lessons much more creative, teaching my students the importance of creativity in their lives… something that will take them through the storms that will encroach upon their lives, and leave them wiser and more confident in themselves for the next stages of their journeys. Hi there! I am fairly new to art journaling and mixed media- it has been changing my life. I would love a spot in LifeBook 2014. The creative act – painting, journaling, quilting, collaging, etc. – just transports me into another world. i could just stay there in “that world” where I am in the flow of my art. It is such a happy place, just me and my imagination spilling out into the project at hand. I spent my childhood drawing and painting, taught my children how much fun it is to create freely, then my grandchildren. Now I am back into it myself, enjoying it more than ever. I would love to take this course and thank you for the opportunity to possibly win a spot in the class. Thank you! For me being creative is sitting down and connecting with my soul. It allows me to shut out all the mundane, everyday events and connect with something inside and outside of myself. For me the creative act is a release and a different place to be. Somewhere that you can explore, experiment, play, doodle and just have fun, without having to live up to anything, or do anything you don’t want to do, there’s a sense of freedom that comes with this sort of opportunity to try the new, to mix new and old, to copy and distort, to try just anything for yourself. And sometimes, just occasionally you end up with something that later you find yourself saying, did I do that? or HOW did I do that? – with a sense of satisfaction and awe. So looking forward to LB 2014 and the fabulous teachers participating. I am currently working my way through LB 2013 and having the time of my life, while I learn from a stellar group of artists. Can’t wait…doing art has changed my life. I look forward every day to the discovery of myself!! Please add me to the list. I’d love to take your class. Being creative has always been so important to me. I grew up knowing I wanted to be an artist. I remember my mom telling people I was born with a paint brush in my hands. As I watch my daughter now who is so incredibly creative and see her spend almost every extra minute of every day creating it reminds me of just how important is is and how much I miss not digging in deeper and spending more time doing my art. This is something I’ve been working on the past few years and look forward to being more creative. I would love to be able to do this class, I have looked since it began, but have never been able to afford the class. Maybe this year I could win a class. Thank you and Tammy for the chance. To me it means taking the time and supplies to make something that had not been there before. Creativity is good for me because my soul needs it! Thanks for the chance to win! As I have moved with intention into being more creative I have found that the time spent art journaling and splashing paint around has had a major impact on the way I live my life outside of my studio…I am more focused, less stressed and calmer. I have been a Life Booker for two years and look forward to your lesson next year. Thanks for a chance to win a spot. Hello Alena, Thank you so much for this generous gift you are offering. What I loved most about my first experience with Lifebook (2013) was that I learned so many techniques and skills from all the diverse talented instructors participating in Tamera’s LifeBook. Taking LifeBook rekindled the memories from childhood that brought me to such a peaceful place. Almost a stillness in my mind…kind of quieting the ‘screaming chatter’ in my mind that tends to drown out all things peaceful and quiet. This is why I am so excited about a chance to participate in LifeBook 2014.